Tenacious representation for victims throughout Washington, D.C. There has been a worrisome amount of reports in the news about healthcare professionals working while under the influence of drugs or alcohol. Aside from the illegality, there are a slew of other potential problems that can and do arise when a doctor, surgeon, nurse or staff member performs a medical procedure while intoxicated. 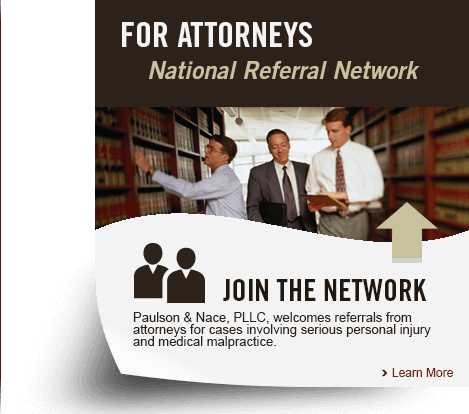 At Paulson & Nace, PLLC, we handle claims involving doctors under the influence aggressively and efficiently. We know there is no excuse for such behavior and that their actions may have put your life or that of your family members at risk. If you were treated at a Washington, D.C. healthcare facility by an intoxicated medical professional, we want to hear your story. Difficulty in having an intoxicated doctor’s license pulled by the state licensing boards in Washington, D.C. In truth, the reasons behind a doctor’s addictions are probably very similar to the reasons behind any addictions: the inability to cope with life’s pressures in a healthy way, and the denial of a problem. At Paulson & Nace, we believe that addiction is an illness – but we also believe that people who are sick need to seek treatment before they infect, harm or lead to the wrongful death of others. These are incredibly complex and delicate medical malpractice cases, and may take a long time to build and present. Our attorneys stay with our clients from beginning to end. Partner Barry Nace once litigated a case for 18 years, because he refused to settle for less than our client deserved. While we make every attempt to resolve our cases quickly, we do not sacrifice our clients’ best interests to reach a speedy resolution that benefits the hospital or offending practitioner. No matter what steps your doctor, surgeon, nurse or other healthcare provider performed while under the influence, Paulson & Nace will fight on your behalf to hold them accountable for their actions. Putting patients’ rights first throughout Washington, D.C.
Paulson & Nace, PLLC, is dedicated to protecting victims and their families throughout Washington, D.C. If you were treated by an intoxicated healthcare provider, our family wants to help you protect your family. Please call 202-930-0292 or fill out our contact form to discuss your case with an experienced medical malpractice attorney.